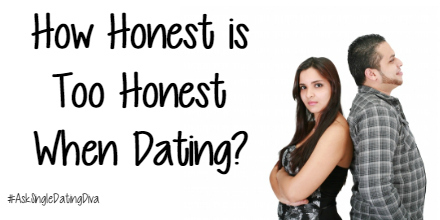 Ask Single Dating Diva: How Honest Is Too Honest When Dating? I met this great guy and we’ve been dating for a couple of weeks. We communicate really well together and pretty much are open about everything. It seems natural just to share everything with him. Even though our interactions seem “no judgment” I am wary of sharing everything about my past, not that there’s anything that scandalous, but just don’t feel it’s “need to know” information. The thing that’s really bothering me is that whenever I offer him constructive feedback on himself he takes it badly, even though he says he’s trying to enhance himself as a person, but when I try to help him enrich himself he takes it badly. I don’t mean it as an insult at all but that’s how he takes it. It seems it’s OK for me to share my deepest darkest secrets but it’s not OK for me to give him feedback about his life. So that’s what I wanted to ask you, is there such thing as too much information when you’re getting to know someone as a potential life partner? How honest is too honest when dating? How Honest Is Too Honest When Dating? Thank you for your email and question. I completely understand your frustrations and confusion. I am also often left wondering how honest is too honest when dating. It seems a case of damned if you do and damned if you don’t. I’ve gotten myself into a bit of trouble and earned myself a case of the silent treatments many a time because I was “too honest”. Then I learned about tact. Using tact when discussing sensitive issues is important because it makes you think twice about what you’re saying and how you’re saying it. Problem is that we do speak out of emotion sometimes and say things we don’t mean which is why it’s best to step away from a tense situation before you say anything you might regret. Try to take the kind and gentle road rather than the bull in the china shop approach. I do believe that you don’t need to share anything and everything with a potential partner. They don’t need your life story, nor do they need to know about every single person you’ve dated and / or slept with. Details are far from necessary, general information here suffices. This includes sharing your number of partners and past sexual history. All you need to share is that you’ve been tested and that you’re safe, or if they are at risk of something it’s their right to know. Otherwise, numbers aren’t necessary. Just be honest and share things you feel they need to know about you and in small doses over time. As for sharing your personal opinion about them, even if you’re trying to be helpful and not malicious, it’s better to opt for not giving your opinion and feedback unless you’re asked and even then be kind and generous with your feedback. It’s not easy for some people to hear criticism or anything potentially negative about themselves so approach the subject gently. I would, however still be honest, but only if they ask. READERS: What would you advise this reader? How honest is too honest when dating? Share your thoughts in the comments below! But not sure if you’re following my blog – but I also trusted him with the knowledge that I blog (albeit not the name). He was the first BF I told. And he later decided we were over, searched for it and read it – reading all those things I didn’t tell him. Not good at all. So maybe I’m not in the right place to give honesty advice at the moment! It depends. Back in my 20’s I was very open sexually. I even considered becoming an adult film star. This part of my life I gloss over because the men I want would not want someone like this. Plus, I’m talking 20 years ago or so and the person I am now is different. I agree with Suzy that honesty needs to be tempered with tact. If someone I’m dating is trying to improve themselves then I would only offer positive advice unless asked about a particular bad habit they have and even then I would stress that the advice I’m giving is out of love. Also people seem to overlook that the male ego is very fragile because it often goes unchallenged and may crumble when attacked directly. In my life I try to be as honest as possible because I don’t have the time or energy to maintain a lie or remember what I am covering up. I recently found out that a lie of omission is still a lie to some, but I think it may have been a good thing, because one it made me think about what I really want in a relationship and that the woman I lost may have wanted more than i could give at the time. I believe that I am a unique form of male in that I don’t care about what goes on when I’m not around and I would prefer that someone be upfront with me at all times. I know some women hide the number of partners they had in the past (Dawn) but at this point I don’t care that was then, this is now and the events of a persons past made them what they are today so you can’t fault them for any of it. which you communicate, as a short-coming. Complement him on what you like and admire about him! Keep things light, for now! Best of luck!